Location: East central Genesee County, Mill Street, LeRoy. From the intersection of Routes 19 and 5 drive east on Route 5 for a little over 0.1 of a mile to Mill Street and turn left (north). In a few hundred feet turn right (east) into a parking lot located behind the post office. The Mill Street Overlook, located in the southeastern corner of the parking lot, is a wooden viewing platform that also has stairs that lead down to a lower viewing area for LeRoy Falls. In 1803 Stoddard and Platt built a grist mill in the area now occupied by the post office. A low dam built at the crest of the falls created a millpond and diverted water to the mill. In 1822 Herman LeRoy replaced the mill with a much larger one. In 1852 his Genesee Flour won a medal at the London Crystal Place Exhibition. LeRoy Falls is located on Oatka Creek and is also known as Old Buttermilk Falls. The falls is 5 feet high and has a meandering crest that is roughly 200 feet long. For most of its crest length the falls is vertical or very steeply terraced. If the volume of Oatka Creek is high during your visit the falls may be drowned and will then appear as a rapids. If the creek volume is very low the height of falls will be over 5 feet. 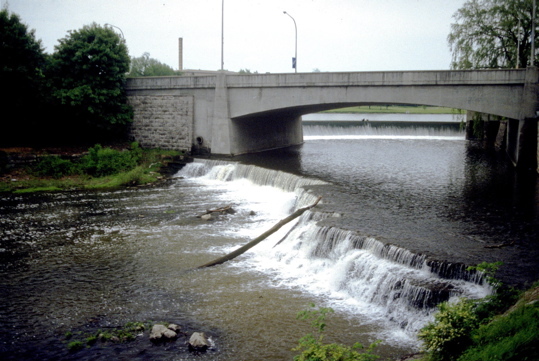 As one looks upstream of the falls there is a view of an overflow dam that is framed by the Main Street Bridge. The dam is 11 feet high and about 150 feet long. It was built in 1934 as part of an Oatka Creek beautification project. LeRoy is the birthplace of "Jell-O." Pearle B. Wait, who was a carpenter by trade, introduced Jell-O to America in 1897. In 10 years Jell-O became a $1,000,000 business. To learn more about this wiggly dessert, and more about LeRoy, visit the Historic LeRoy House at 23 East Main Street (Route 5). It is located about 1,000 feet east of the post office. An interesting boulder is located 7 miles west of LeRoy along Route 5. Click here to go to the Devil's Rock page.